It amazes me how many people do not know the basics with a knife. My stomach turns when I see people laying their hand flat to hold what they are cutting, or cutting something round without creating a flat surface. I guess I use sharper knives than the average home cook but there are little technique tricks that can help someone prepare food properly, safely and with minimal waste. Onions are one of the most common ingredients in many of my recipes and pretty much anyone else’s recipes. They are great for adding depth of flavour and body to sauces and soups but they also can enhance all kinds of other dishes. Because of their prevalence they should be something we can all work with. This is however not the case. I go to restaurants where clearly the people in the kitchen do not know how to break down onions, so why should I really expect a home chef to know this. 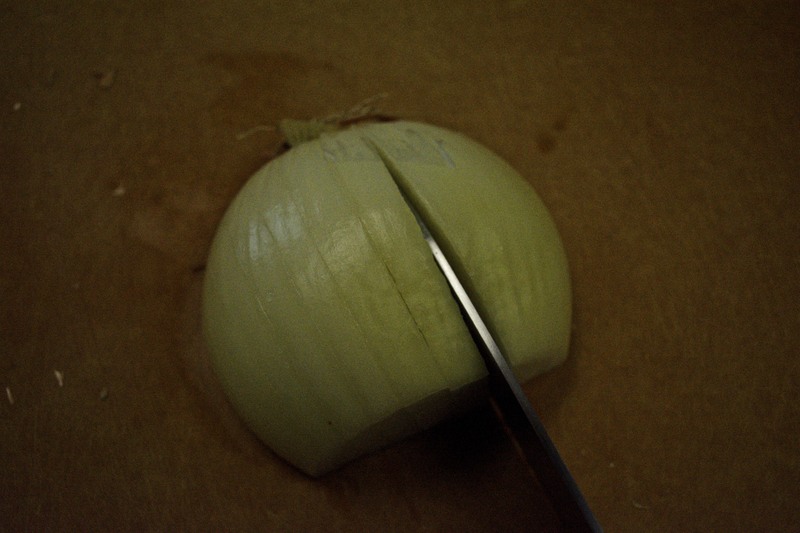 So here is my quick and easy tutorial on how to properly cut an onion. When handling a knife I am making the assumption that you are using an ultra sharp carbon steel blade that has just been sharpened and honed. By making that assumption, I am going to quickly talk about how to safely use your knife when you are cutting anything. First and foremost is to have a work area that allows you to free movement having things encircling you while you work with a knife is a great way to lose focus on what you are doing or have your technique impeded by a lack of space. Second is the idea that flat surfaces are your friend. You, for sure, want to cut on a flat surface but you also want what your cutting to also have a flat surface when ever possible. Roundness means movement, movement means a less consistent target, which means theres is an increased chance of your knife slipping and doing damage. I have made fingertip sashimi a couple times it’s not a pleasant experience. Finally hand position is a huge way to protect yourself. The claw grip technique is a great way to ensure your fingers stay out of the way of the blade but also hold your food in place. When breaking down an onion there is a tried and true method to quickly and most efficiently remove the skin, and cut the onion to your specific size needs. 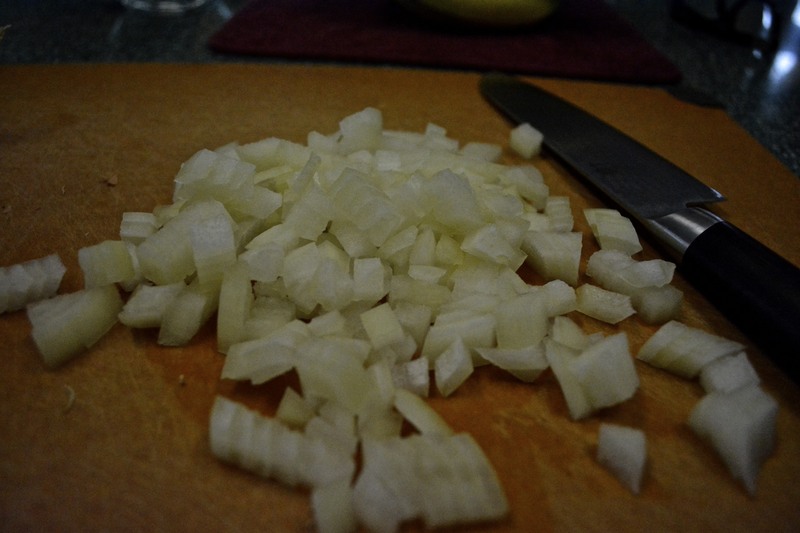 I like using a chef’s knife to break down onions but a Santoku also works well if that is all you have. You first and foremost need to half the onion length wise. This will give you a flat surface to work with. 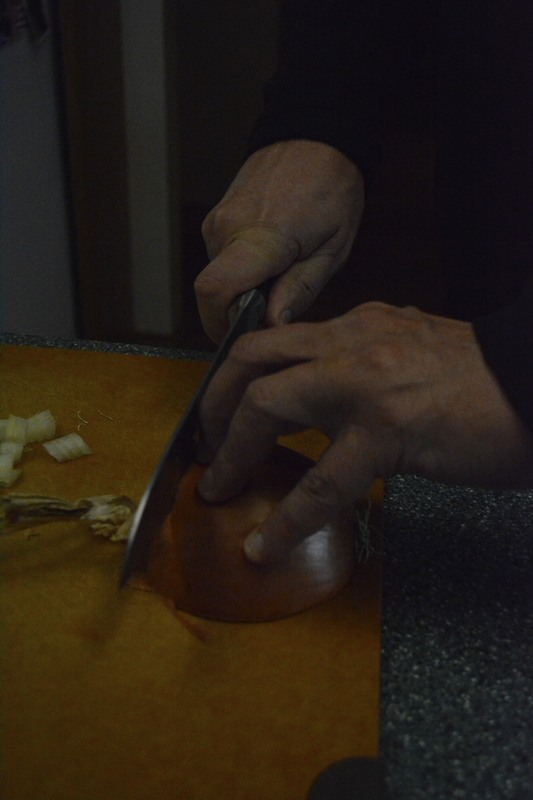 You then need to cut off the non-root end of the onion. Once you’ve done this removing the skin is very easy as compared to fumbling around trying to get the skin off the onion. You want to leave the root end on the onion think of it as a handy way to keep your onion all together. 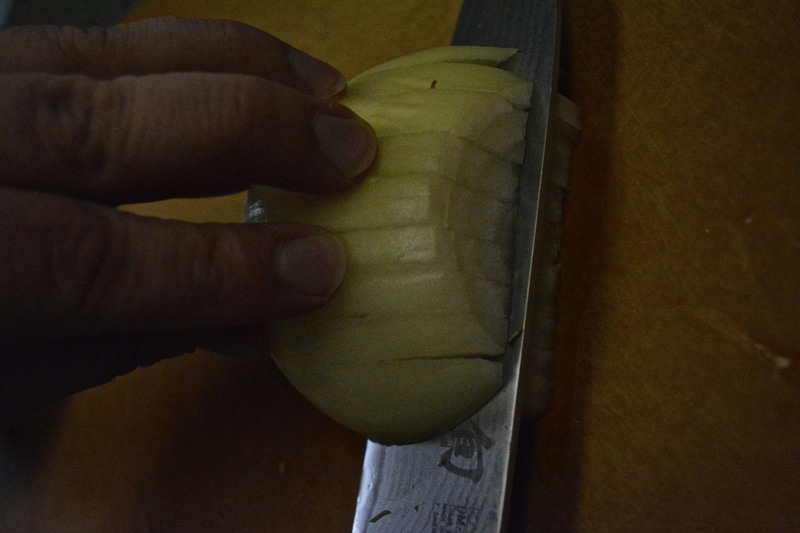 It also allows you to keep pressure on the onion while also keeping your fingers clear of the blade. 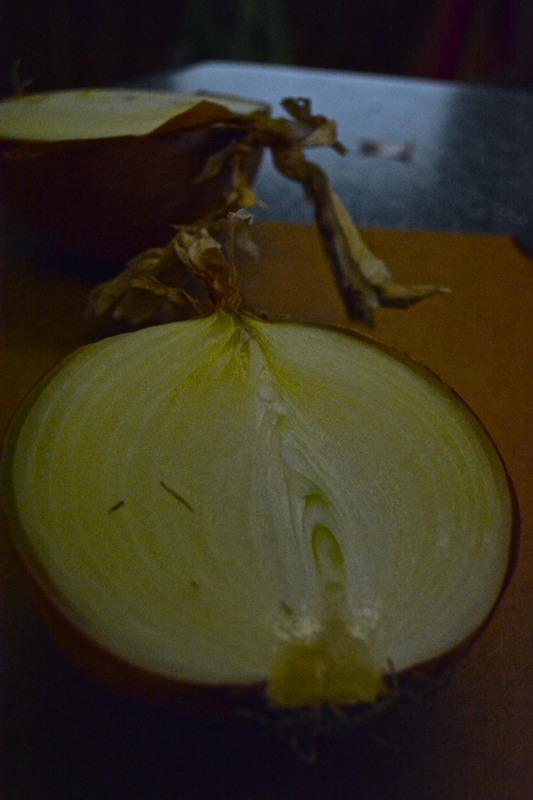 You then want to slice the onion length wise but don’t cut all the way to the root. 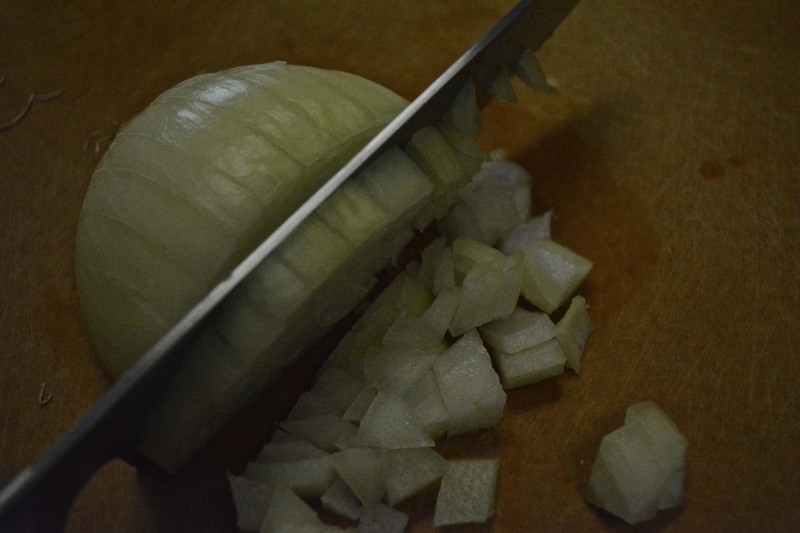 I like to cut the onion by dragging the blade slightly away from the root and away from my fingers. You can choose the size of cut while you make this cut at well. If you want a very fine dice adjust your knife cuts, if you want something larger change the cut accordingly. You then want to turn your knife and cut parallel to the cutting board, this is the least safe cut you can make but it will really make your job easier in the long run. So be careful and position your off hand away from the blade. I usually do two of these cuts. You then want to cut perpendicular to the cutting board which will produce a nice even dice. You can of course adjust the cut to the size you want. When learning to use a knife I would recommend the philosophy of getting good before you get fast. People watch cooking shows and see the knife skills of professional chefs and try to mimic their speed rather than their technique. 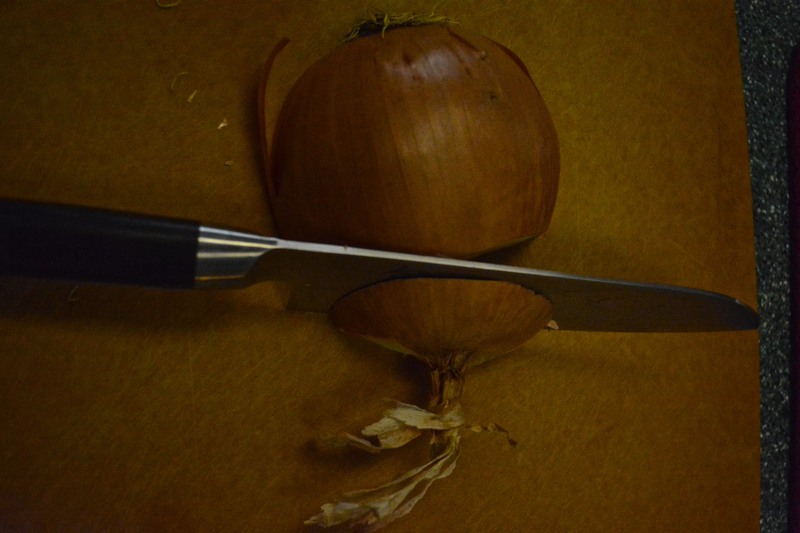 This entry was posted in art, Business, Cooking, Food, Food Reviews, How To, Photography, Photos, recipes, Travel, Uncategorized and tagged Cooking, cooking technique, cuisine, Cutting an onion, DIY, eating, flat surface, Food, how-to, Knife skills, knives, onion, onions, Skills, technique. Bookmark the permalink.